Size : Feves - 8 oz. re-sealable bag. Feves - 16 oz. re-sealable bag. Feves - 3 kg / 6.6 lbs original bag Feves - 32 oz. re-sealable bag. 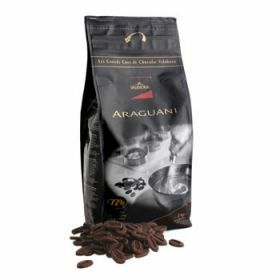 Grand Cru Araguani 72% Astonishing Contrasts for this chocolate couverture, 72% cocoa - A blend of Criollos and Trinitarios cocoa beans from Venezuela. - A powerfully bitter base with strong liquorice, raisin and chestnut notes. Burnt aromas of honey and hot bread. Technical use include pastry, chocolate fillings, moulding, couverture and icing. Ingredients: Cocoa beans, brown sugar, cocoa butter, natural vanilla flavor. Emulsifier: soy lecithin. This product may contain traces of nuts, milk and egg proteins, gluten and peanut. Valrhona feves are easier to melt than bars -- does not require breaking and/or chopping -- Each feve weighs 3gr making it easy to weigh without a scale -- 19 feves equals 2 oz. Recently Valrhona USA introduced a price incentive for their distributors to report monthly detailed sales of Valrhona products. To be eligible for the highest discount level, they asked that the names and addresses of all customers and their specific Valrhona purchases should be reported on a monthly basis. The report must be started for the 12 months prior to the price incentive program taking place, and is done without the customers' prior authorization or knowledge. At L'Epicerie, we value our customers privacy and fully respect their rights to privacy on shopping habits regarding quantity and frequency of product purchase. For this reason, we will not be abiding by the request from Valrhona to provide this information. Thank you for your understanding and for keeping this in mind as you evaluate the offerings and pricing available on L'Epicerie.